"The Heart of the Catskills"
The Town of Liberty was created from the Town of Lumberland in 1807 and was settled mostly by families from Connecticut and other eastern states. Around 1800 settlers arrived in Parksville. Lemuel Martin and Eber Hall are attributed to be the first settlers. William Parks and his family arrived shortly after and started to build mills and improve the area. Martin wanted to call it Martinville but the settlers revered Parks more, and hence the name Parksville. 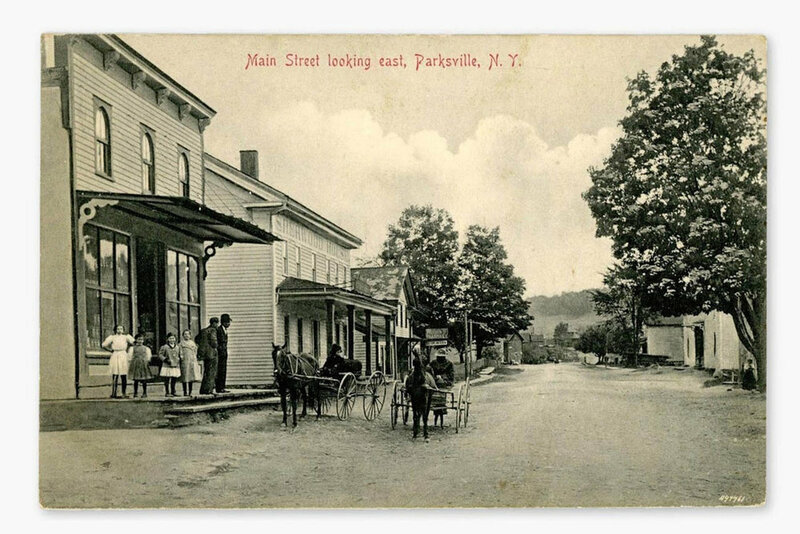 Although Parks later moved to Ulster County, when he was 80 he visited Parksville, fell ill and wanted to be buried there. His grave and those of his extended family are in the Baptist Church Cemetery behind the currently active church, built in 1898. The Baptist Church in Liberty is an offshoot of the original Baptist Church in Parksville. Another house of worship, the Tefereth Israel Anshei Parksville Synagogue, was built in 1907 and is currently inactive. Both houses of worship have been added to the National Register of Historic Places. Parksville used to be a hamlet of the Town of Rockland, but the inhabitants decided to annex to Liberty because it was only 4 miles away. Parksville was originally a swamp but became forested and dry. It is in a valley surrounded by hills and the Little Beaver Kill River runs through it. William Bradley built a tannery, and James Bush, also a prominent resident, was a merchant and politician and invested in Bradley's tannery. Parksville had shops and mills and was a bustling community. This was back in the day in the early 1800's when coffee was 36 cents a pound, a gallon of brandy was $1.00, and panthers roamed the hills. The Ontario & Western Railway (the O&W) mainly contributed to the fast growth of the Catskill area in the late 1800's up through the 1930's. The railroad served the surge of building of summer hotels and houses. Parksville was a popular railroad stop on the O&W and became touted as a pretty village in the heart of the trout country. considered a peaceful resting destination spot. Within two decades the hamlet had become so popular that it was no longer a quiet, peaceful place. Main Street was so clogged with throngs of people shopping that cars couldn't get through. There were listed 39 hotels and resorts in Parksville, later upwards to 100. After the Great Depression, however, many businesses failed. The large resort hotels still thrived - the Grand Hotel, Klein's Hillside, the Paramount, and Breezy Hill to name a few. The Young's Gap Hotel was built in the 1920's and was the prize of Parksville. A well-known landmark, Young's Gap, named after a Liberty family, was made famous by the railroad surveyors. It thrived through the 1960's as a fun place to stay. Unfortunately, over the decades there was a decline. The popularity of the railroad through the Catskills diminished and the last trains ran through Parksville in the late 1950's. Vacationers flocked to New Jersey and Long Island beaches and the vogue of the Catskills waned. The doors of those huge resorts began to close where there had been very successful night clubs, comedy acts, and indoor shopping meccas. The highway Route 17 called "The Quickway" was built and ran through Parksville, parallel to Main Street. Much of the highway was built right over the railroad bed. There was a stoplight (the only one on the Route) which slowed traffic, and tourists would stop in the hamlet to explore. There was a brief revival of Parksville in the 1990's. A handful of enthusiastic business owners worked together to bring Parksville to life. Dead End Café, owned by Tom and Michele Caltabellotta, was opened in 1989 and helped to kickstart new growth on Main Street: another restaurant, an antique shop, a coffee shop, a silk-screening studio, a tattoo parlor, a video store and a beauty salon, among others. However, Parksville would soon suffer again. Route 17 was going to be converted to Interstate 86 (I86), the stoplight would be removed, and the highway would bypass the hamlet, which had an adverse impact on the flow of traffic towards Main Street. Travelers became confused how to get to Parksville, which was now an exit off the highway - Exit 98. It had lost it's feeling of a destination spot and most businesses on Main Street, and ones that had been on the highway, pulled out. However, miraculously many businesses are still in operation today. parking lot, and restored the O & W Railroad path which runs along the river. This has now spurred growing interest in the community's future growth. The O & W Railroad path in Parksville is now an active Rails to Trails, and a community effort by Liberty and Parksville is ongoing to beautify it with flowers and signage, and plan to connect it to the Town of Liberty to make it a longer trail for walking and biking. New businesses are beginning to anchor on Main Street just in the last year. Revitalization is forthcoming.